This past weekend, we took a trip to a local orchard. This is something we always do in the Fall, usually several times. It’s as much a part of the change of seasons as falling leaves, sweatshirts, and college football (go Irish!). 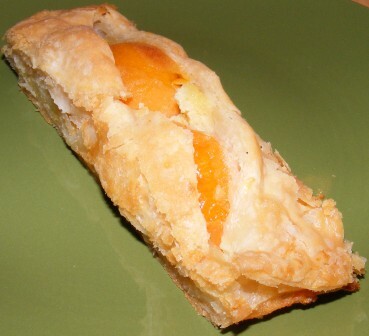 On this trip M surprised me by asking for a half peck of peaches so that she could bake a peach pie. 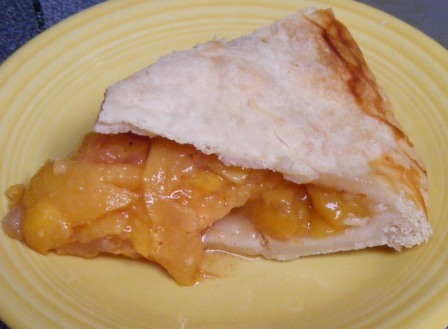 Other than the deep dish peach pie with lattice topping that I made recently for the Modern Baker Challenge, I don’t know that I’ve made a peach pie since M was born. 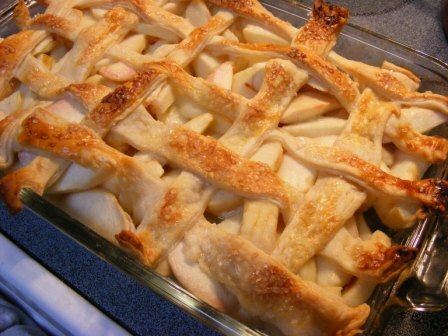 I love peach pie, I just never bake them. But I’m always one to encourage my girls’ baking endeavors, so we bought the peaches, along with some Honeycrisp apples, cider, caramel apples, and fudge. 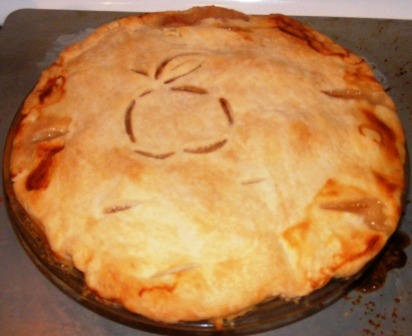 M wanted to make the pie all on her own, using a recipe from Better Homes & Gardens. 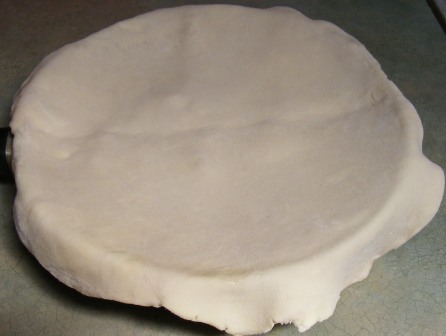 She even turned down the offer of a premade crust from the freezer. So I advised her to chill her pastry ingredients and explained how to use a boiling water bath to peel the peaches, then got out of the way. She came up with the idea for the fruit cut-out on her own and did it freehand. 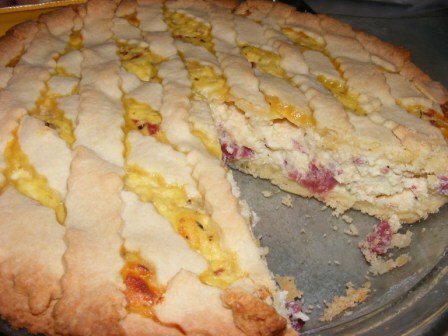 It was late when she finished baking the pie, so we let it cool overnight and had it for breakfast the next morning. 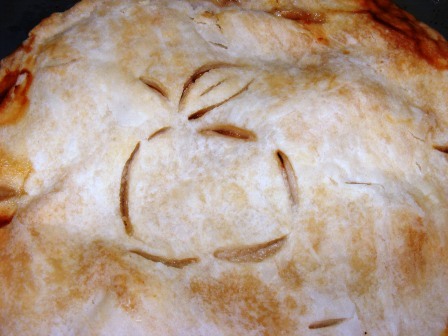 I was amazed — but not surprised — by how delicious the pie came out. 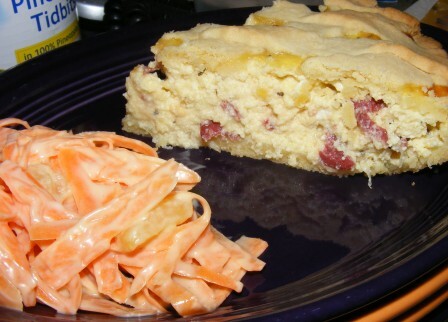 The crust was flaky and perfectly done, and the filling was fruity, spicy, and very flavorful. It’s good to know M didn’t inherit my pastry gene. 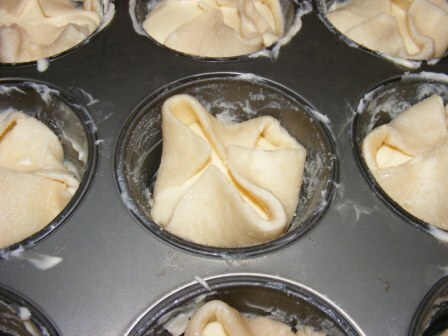 After baking about 50 tarts and pies for the Modern Baker Challenge, I’ve finally overcome my mental block with pie crust. M somehow nailed it on her first try. After my recent tatin disaster, you’d think I wouldn’t want to rush right back in and try another one. But as I’m never one to let a little thing like failure dissuade me, jump back in I did. 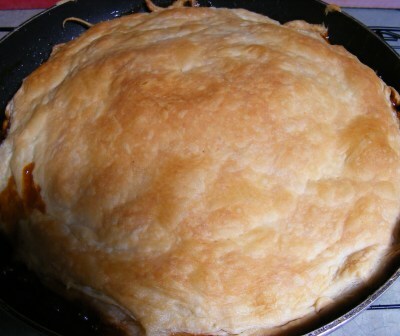 Besides, this it the real thing — a classic apple tarte tatin. 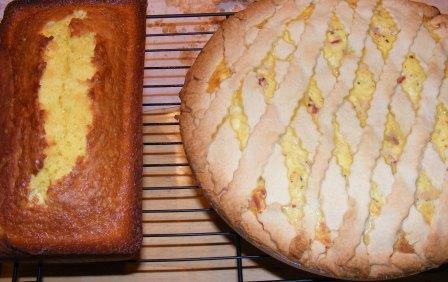 Having learned from my issues with the pineapple tatin, I did make some changes this time. 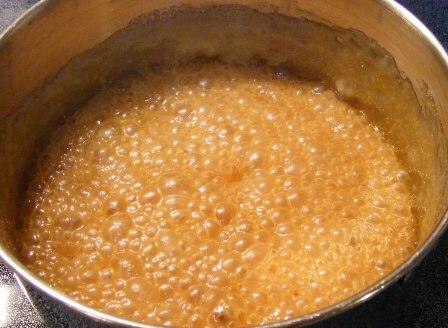 To begin with, I made my caramel in a saucepan. 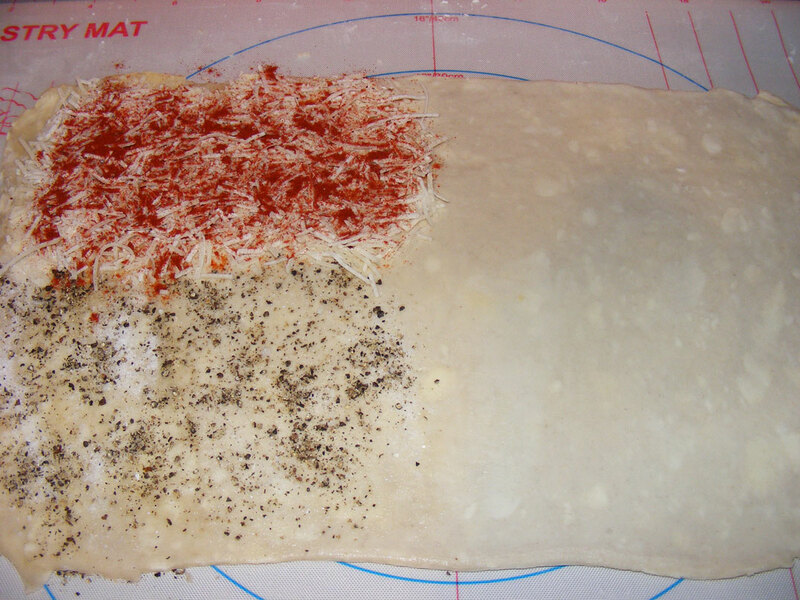 That way, I could pour it out as soon as it was done so it wouldn’t overcook. 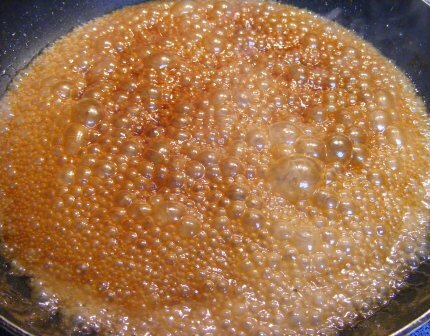 Now that, my friends, if perfectly cooked caramel. Despite my history of burning caramel, this time I nailed it. 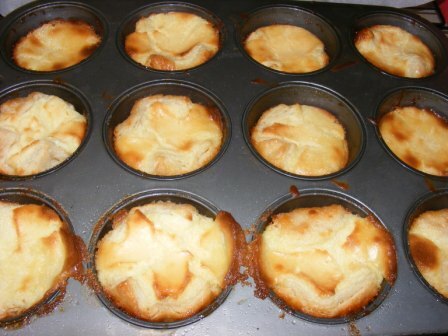 The other change I made to the recipe was to bake it in a cake pan instead of a sauté pan. 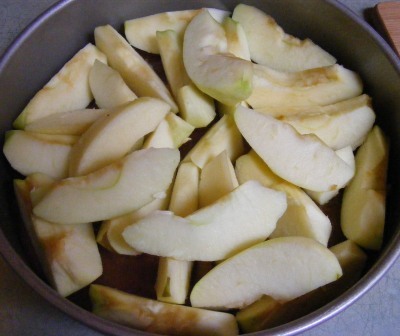 I poured the cooked caramel into the cake pan, then layered on the apples. 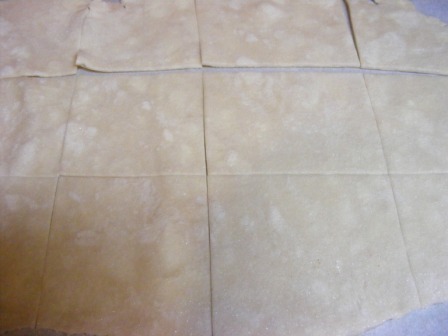 I covered the pan with puff pastry dough, which didn’t melt this time, as the pan wasn’t hot. 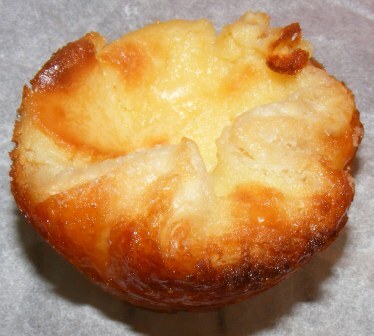 I baked the tatin at 350°F for about an hour, then cooled it a bit before turning it out onto a plate. 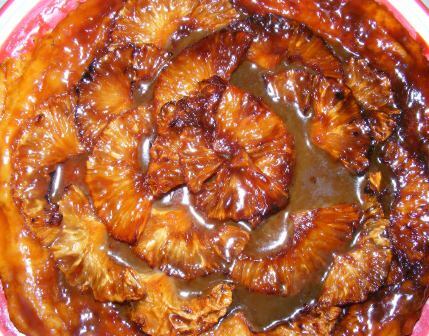 It was obvious at first glance that the caramel wasn’t overcooked on this tatin like it was when I made the pineapple tatin, and I was hopeful that this one would make up for the disaster I had the first time around. I didn’t have any ice cream, so I served this one naked. As it turned out, this tatin didn’t need any adornment. It was delicious. 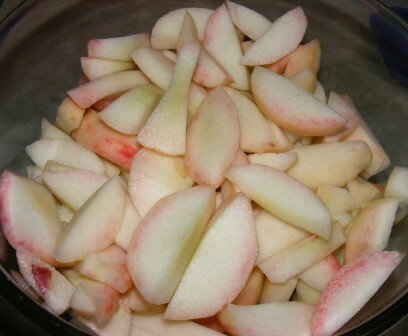 The caramel was perfectly cooked and complemented the apples beautifully. I would gladly make this again, caramel and all. 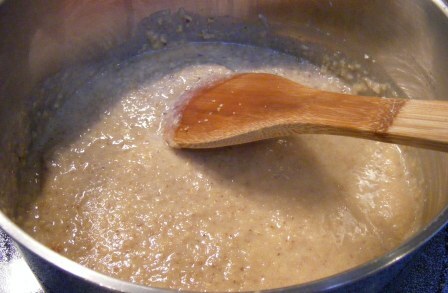 In fact, this may just be the recipe to help me overcome my mental block with caramel. 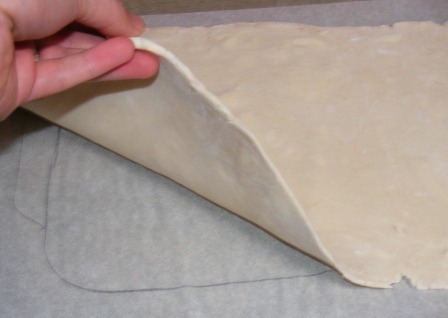 I knew this week’s recipe for the Puff Pastry section of the Modern Baker Challenge was going to give me trouble. Like my well-known issues with pie crusts, I’ve always struggled with caramel. It goes from amber to burnt so quickly, and I usually end up having to make it twice. Nonetheless, I bought my pineapple, assembled my ingredients, and got to work. 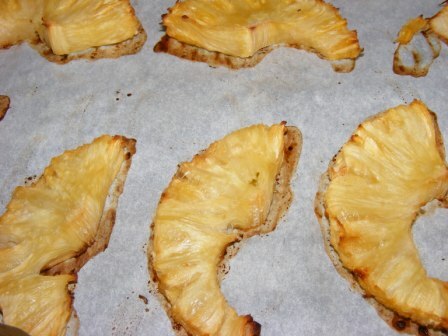 I began by roasting the pineapple until it was cooked and slightly dried. While the pineapple cooled, I made the caramel sauce. 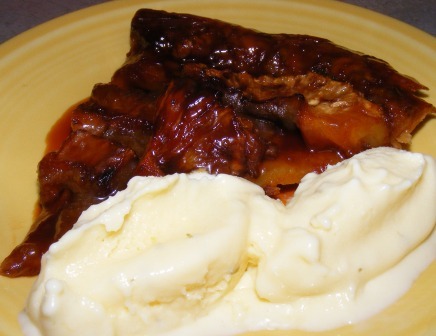 This recipe is unique in that the tatin is baked in the same pan that you use for the caramel sauce. 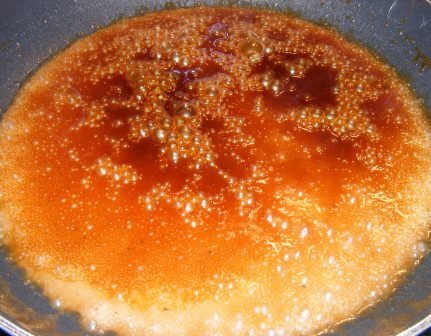 One of the problems with this is that the caramel continues to cook after you remove it from the heat, so you have to be careful not to overcook it. In my own defense, I don’t think the caramel was actually overcooked when I took it off the heat. But it, of course, kept cooking after I removed it from the heat. 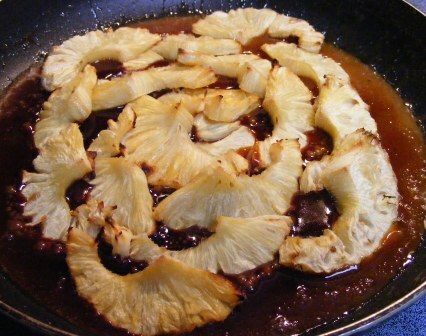 I turned my attention to the pineapple, and by the time I got back to the pan, the caramel looked a bit overdone. 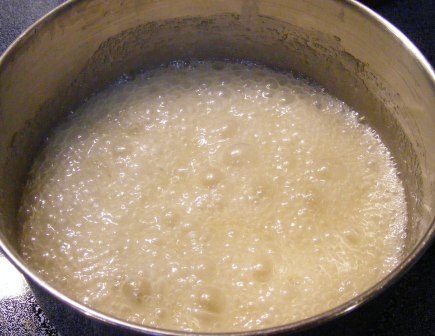 The caramel contained sugar, corn syrup, water, and butter and only took about 10 minutes to make; so I should have made it again as soon as I suspected it was burnt. But, of course, I didn’t. 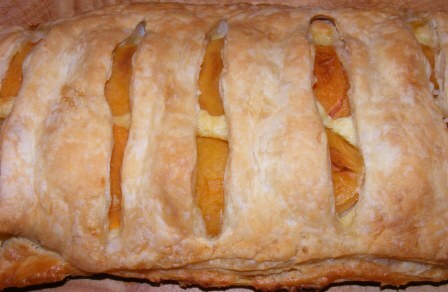 I layered on the pineapple, covered the top with puff pastry dough, and baked it. 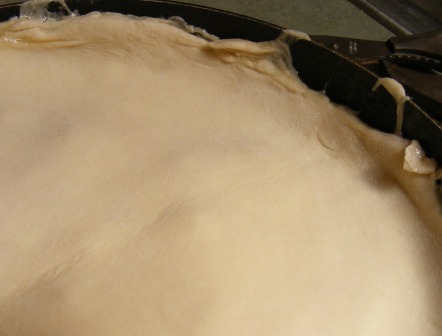 Another issue created by the hot pan was that the puff pastry dough started to melt when I laid it over the top of the tatin. This didn’t seem to negatively impact the baked tart too much. 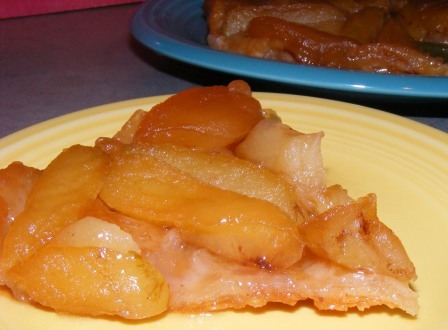 I let the tatin cool in the pan for a few minutes, then turned it out onto a plate. It smelled delicious with the caramel and pineapple, and I was hopeful that the caramel hadn’t overcooked to the point of bitterness. After the tarte had cooled, I cut a slice and plated it with some homemade vanilla ice cream. One bite was all it took. The pineapple was sweet and well-caramelized. But the caramel was overcooked and inedible. 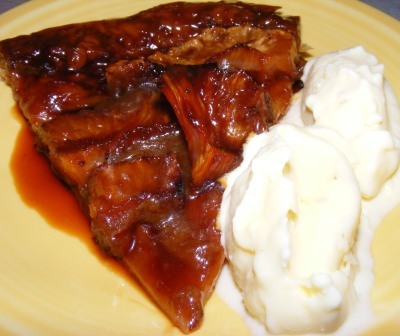 I ate the ice cream (no sense wasting that), then threw out the slice and the rest of the tatin. Fortunately, it wasn’t a particularly difficult or time-consuming recipe, nor did it call for a lot of ingredients. But it was still a huge disappointment. Don’t get me wrong: there was nothing wrong with the recipe as written. All of my problems were operator error. 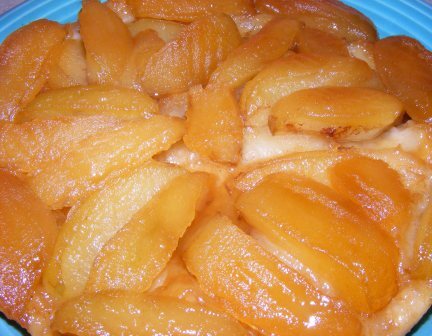 Unfortunately, they were enough to ruin the entire tatin. And it made me that much more anxious about the next recipe: apple tarte tatin. 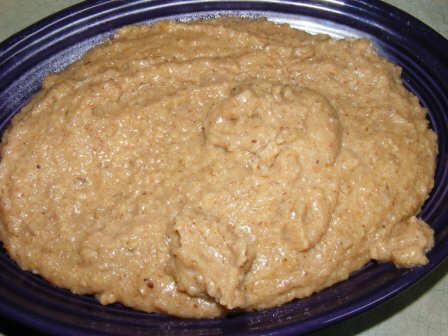 It’s the same basic recipe made with raw apples instead of roasted pineapple. You’ll have to come back in a few days to see how that turned out. 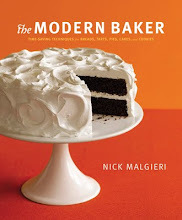 “If you can’t find perfectly ripe peaches, make the apple or plum variation.” So says Nick Malgieri in the introduction to this recipe. Reading the ingredients, you quickly understand why. 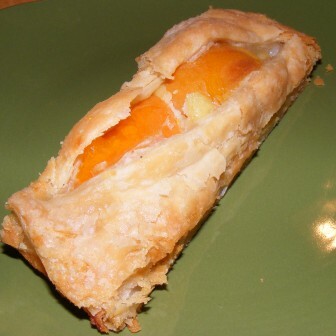 Other than the peaches, the filling contains nothing but sugar, a few tablespoons of flour, and some nutmeg. The peaches are clearly the star of the show. So, with all of that, you’d think I’d heed Nick’s warning, wouldn’t you? Anyone who has made as many of Nick’s recipes as I have and trusts that he knows what he’s talking about wouldn’t try this recipe without perfect peaches. Except me. But more on that in a minute. 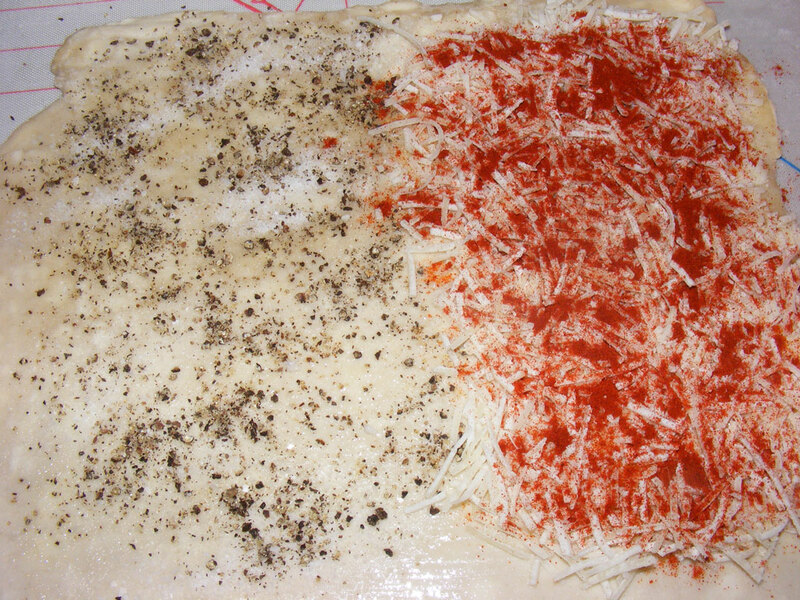 This recipe is very simple to put together. 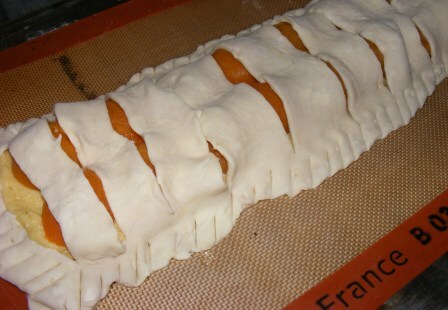 After rolling out and shaping the puff pastry, you prepare the peaches, mix them with a little sugar and spice, then put the whole thing together and bake it. 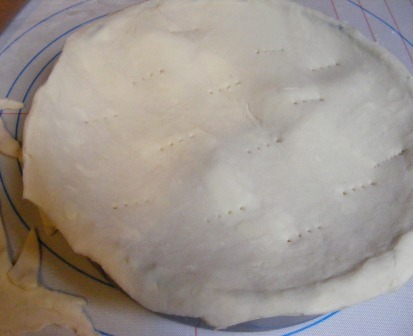 I started by making the woven lattice crust. 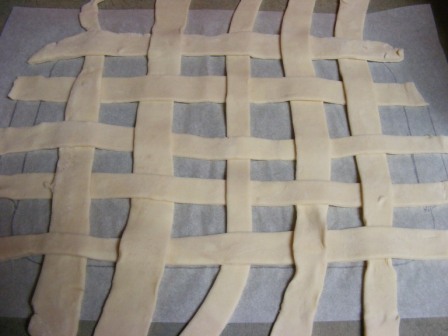 This part might seem a bit intimidating if you’ve never made a lattice topping before, but Nick’s instructions make it simple. 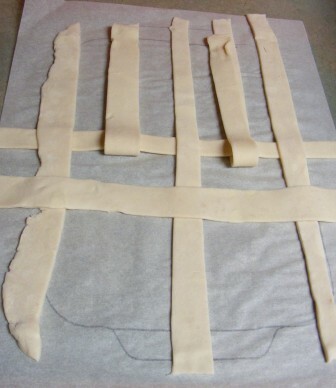 I began by drawing an outline of my pan on parchment paper, then rolling puff pastry into a rectangle slightly larger than the outline. … and removed every other strip. 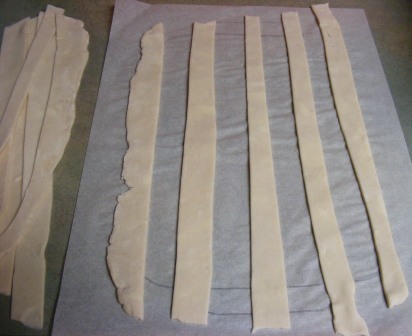 Then I folded the first, third, and fifth strips back to the center, laid a strip of dough crosswise over the remaining dough, folded the strips back down, and repeated with the second and fourth strips. 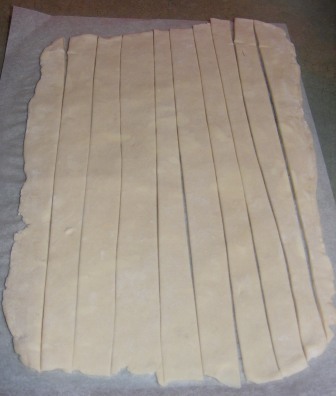 I turned the parchment around and did the same thing from the other end, and I had my lattice top. 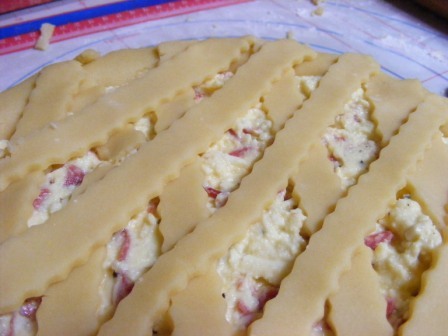 I slid the lattice into the fridge while I prepared the filling. 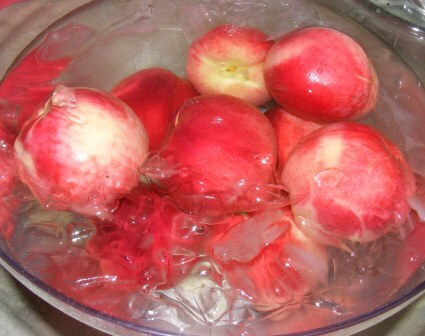 To prepare the peaches, I put a pot of water on to boil and filled a bowl with ice water. After cutting a small “X” in the base of each peach, I plunged them into the boiling water for a few seconds, then moved them to the ice bath. When I began to peel the peaches, it quickly became obvious that they were underripe. The skins, which should have slipped off, clung stubbornly to the peaches. When I switched from a paring knife to a peeler, it was apparent that the flesh, which should have squished under the pressure of the peeler, was firm and underripe. Heeding Nick’s warning, I should have stopped right then and either switched to apples or plums, or returned to the store to buy different, riper peaches. At the very least (as I realized later), I should have returned the peaches to the boiling water to loosen the skins and soften the peaches somewhat. Of course, I didn’t do any of those thing, but rather, proceeded stubbornly with the pie. 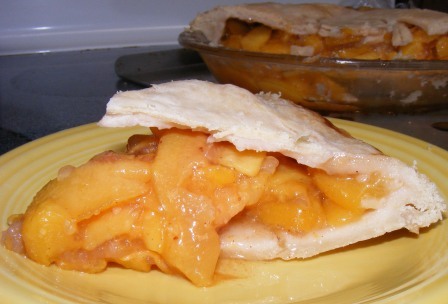 Once all the peaches had been peeled and sliced, I mixed them with the sugar, flour, and nutmeg. 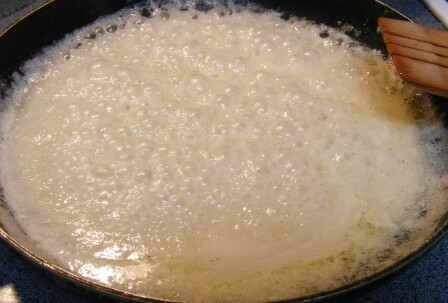 I scraped the mixture into the pan, then topped it with chunks of cold, unsalted butter. 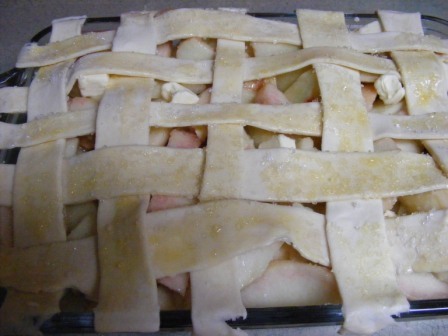 I took the lattice crust out of the refrigerator, brushed it with egg wash, sprinkled it with finishing sugar, and slid it onto the pie. 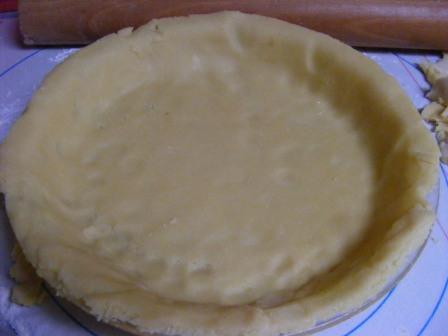 I baked the pie in a 375° oven for about 35 minutes, until the crust was golden and the filling was nice and bubbly. 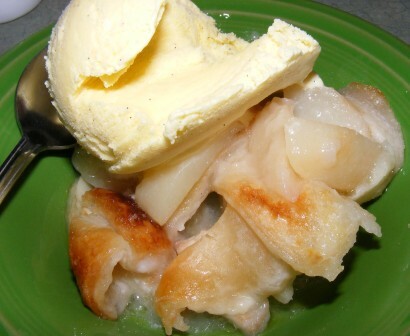 I served the pie with homemade crème anglaise ice cream, which I hoped would make up a bit for the lackluster peaches. 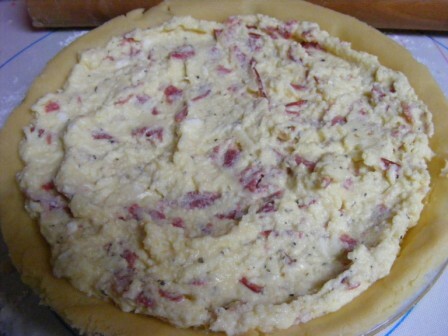 Now, you’re probably expecting to read that this pie was tough and entirely lacking in flavor. To my surprise, however, it was actually delicious. 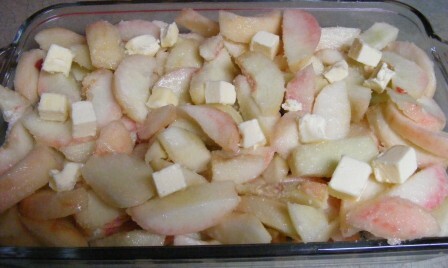 Yes, the peaches were a bit on the firm side (although they did soften up considerably in the oven). 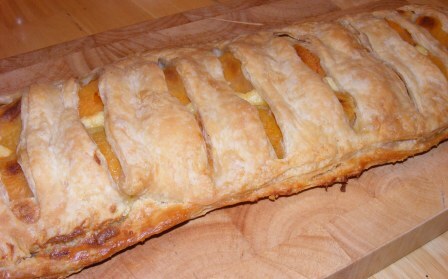 And the flavor wasn’t as bright and “peachy” as it might have been with ripe peaches. But it was still really good. 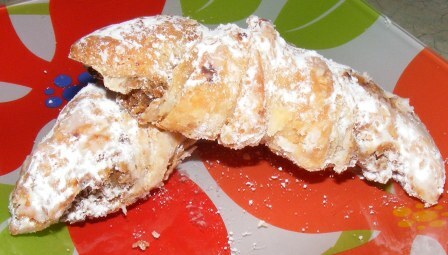 I made this recipe as part of the Modern Baker Challenge. And it’s one I’ll definitely make again. 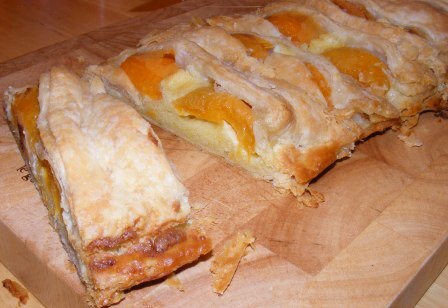 But next time, with perfectly ripe peaches.